Church of Christ Lesbian: Don't Rush God's Timing! I don't know about you but I forget that God has this and I try to rush Him. I want things and I want it now! And oh how I get myself into trouble! I push for things and find myself in a heap trying to get out of it and having to beg God to help me once more fix things, but if I had just let Him do things in His time, it would have been much easier. For instance, I really wanted to get a laptop. I justified getting it because then I could post here more easily at home and work on my book. I could have waited, shopped around, price checked, and made sure I had the funds. Yet I wanted it now. So I went off to Walmart and bought one. Oh how nice it was, till I realized it didn't hold a charge. Also, found online it cheaper. And that money I used, well I should have saved because the car broke down and I needed to repair it and that meant I was short on funds for a week till pay day. I should have waited. Another example, I tried to rush God's timing in dating. I wanted someone and was tired of being alone. So, I started looking online. I met a few people but every time I tried to go on a date, they would cancel. I started to get depressed and think no one wanted me. Then it dawned on me, I was still working on cleaning up my past, I was not ready for a relationship. Friends yes, girlfriend no. When I realized this, I was able to be content in the matter and not be down about it. God knew I could not be there for the other fully yet. I still had healing to do. And lastly, I wanted to rush and get my book out. I wrote three days straight. I thought I had done good. I was proud of it. I shared it though with three people and what I thought was a book turned out to be a good summary and not a story. It was not ready to do the good that God has planned for it. So now I am taking my time with it and writing the story out like I am supposed to. God knows how things are to be, if we just get out of the way and follow His lead, then things go a lot easier. I know for me I will meet the gal that will walk with me when we are both ready, I will finish the book when it is truly a story ready to help others, and all things done with His timing in mind are blessed. 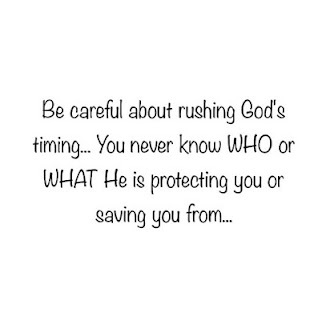 So what are you forcing to be in your timing and what are you allowing to be in His timing?